Mars Global Surveyor (MGS) was an American robotic spacecraft developed by NASA's Jet Propulsion Laboratory and launched November 1996. Mars Global Surveyor was a global mapping mission that examined the entire planet, from the ionosphere down through the atmosphere to the surface. As part of the larger Mars Exploration Program, Mars Global Surveyor performed monitoring relay for sister orbiters during aerobraking, and it helped Mars rovers and lander missions by identifying potential landing sites and relaying surface telemetry. It completed its primary mission in January 2001 and was in its third extended mission phase when, on 2 November 2006, the spacecraft failed to respond to messages and commands. A faint signal was detected three days later which indicated that it had gone into safe mode. Attempts to recontact the spacecraft and resolve the problem failed, and NASA officially ended the mission in January 2007. Establish the nature of the magnetic field and map the crustal remnant field. Continued weather monitoring to form a continuous set of observations with NASA's Mars Reconnaissance Orbiter, which reached Mars in March 2006. Imaging of possible landing sites for the 2007 Phoenix spacecraft, and the 2011 Curiosity rover. Observation and analysis of key sites of scientific interest, such as sedimentary-rock outcrop sites. Continued monitoring of changes on the surface due to wind and ice. The Surveyor spacecraft, fabricated at the Lockheed Martin Astronautics plant in Denver, is a rectangular-shaped box with wing-like projections (solar panels) extending from opposite sides. When fully loaded with propellant at the time of launch, the spacecraft weighed 1,060 kg (2,337 lb). Most of Surveyor's mass lies in the box-shaped module occupying the center portion of the spacecraft. This center module is made of two smaller rectangular modules stacked on top of each other, one of which is called the equipment module and holds the spacecraft's electronics, science instruments, and the 1750A mission computer. The other module, called the propulsion module, houses Surveyor's rocket engines and propellant tanks. The Mars Global Surveyor mission cost about $154 million to develop and build and $65 million to launch. Mission operations and data analysis cost approximately $20 million/year. The Mars Orbiter Camera (MOC) science investigation used 3 instruments: a narrow angle camera that took (black-and-white) high resolution images (usually 1.5 to 12 m per pixel) and red and blue wide angle pictures for context (240 m per pixel) and daily global imaging (7.5 km per pixel). MOC returned more than 240,000 images spanning portions of 4.8 Martian years, from September 1997 and November 2006. A high resolution image from MOC covers a distance of either 1.5 or 3.1 km long. Often, a picture will be smaller than this because it has been cut to just show a certain feature. These high resolution images may cover features 3 to 10 km long. When a high resolution image is taken, a context image is taken as well. The context image shows the image footprint of the high resolution picture. Context images are typically 115.2 km square with 240 m/pixel resolution. The Mars Relay antenna supported the Mars Exploration Rovers for data relay back to Earth in conjunction with the Mars Orbiter Camera's 12 MB memory buffer. In total, more than 7.6 gigabits of data were transferred this way. The Surveyor spacecraft was launched from the Cape Canaveral Air Station in Florida on 7 November 1996 aboard a Delta II rocket. The spacecraft traveled nearly 750 million kilometers (466 million miles) over the course of a 300-day cruise to reach Mars on 11 September 1997. Upon reaching Mars, Surveyor fired its main rocket engine for the 22-minute Mars orbit insertion (MOI) burn. This maneuver slowed the spacecraft and allowed the planet's gravity to capture it into orbit. Initially, Surveyor entered a highly elliptical orbit that took 45 hours to complete. The orbit had a periapsis of 262 km (163 mi) above the northern hemisphere, and an apoapsis of 54,026 km (33,570 mi) above the southern hemisphere. This image taken by Mars Global Surveyor spans a region about 1,500 m (4,921 ft) across, showing gullies on the walls of Newton Basin in Sirenum Terra. Similar channels on Earth are formed by flowing water, but on Mars the temperature is normally too cold and the atmosphere too thin to sustain liquid water. Nevertheless, many scientists hypothesize that liquid groundwater can sometimes surface on Mars, erode gullies and channels, and pool at the bottom before freezing and evaporating. After orbital insertion, Surveyor performed a series of orbit changes to lower the periapsis of its orbit into the upper fringes of the Martian atmosphere at an altitude of about 110 km (68 mi). During every atmospheric pass, the spacecraft slowed down by a slight amount because of atmospheric resistance. The density of the Martian atmosphere at such altitudes is comparatively low, allowing this procedure to be performed without damage to the spacecraft. This slowing caused the spacecraft to lose altitude on its next pass through the orbit's apoapsis. Surveyor used this aerobraking technique over a period of four months to lower the high point of its orbit from 54,000 km (33,554 mi) to altitudes near 450 km (280 mi). On 11 October, the flight team performed a maneuver to raise the periapsis out of the atmosphere. This suspension of aerobraking was performed because air pressure from the atmosphere caused one of Surveyor's two solar panels to bend backward by a slight amount. The panel in question was slightly damaged shortly after launch in November 1996. Aerobraking was resumed on 7 November after flight team members concluded that aerobraking was safe, provided that it occurs at a more gentle pace than proposed by the original mission plan. Under the new mission plan, aerobraking occurred with the low point of the orbit at an average altitude of 120 km (75 mi), as opposed to the original altitude of 110 km (68 mi). This slightly higher altitude resulted in a decrease of 66 percent in terms of air resistance pressure experienced by the spacecraft. During these six months, aerobraking reduced the orbit period to between 12 and 6 hours. From May to November 1998, aerobraking was temporarily suspended to allow the orbit to drift into the proper position with respect to the Sun. Without this hiatus, 'Surveyor' would complete aerobraking with its orbit in the wrong solar orientation. In order to maximize the efficiency of the mission, these six months were devoted to collecting as much science data as possible. Data was collected between two and four times per day, at the low point of each orbit. Finally, from November 1998 to March 1999, aerobraking continued and shrank the high point of the orbit down to 450 km (280 mi). At this altitude, Surveyor circled Mars once every two hours. Aerobraking was scheduled to terminate at the same time the orbit drifted into its proper position with respect to the Sun. In the desired orientation for mapping operations, the spacecraft always crossed the day-side equator at 14:00 (local Mars time) moving from south to north. This geometry was selected to enhance the total quality of the science return. High resolution topographic map of Mars based on the Mars Global Surveyor laser altimeter research led by Maria Zuber and David Smith. North is at the top. Notable features include the Tharsis volcanoes in the west (including Olympus Mons), Valles Marineris to the east of Tharsis, and Hellas basin in the southern hemisphere. The spacecraft circled Mars once every 117.65 minutes at an average altitude of 378 km (235 mi). It is in a near polar orbit (inclination = 93°) which is almost perfectly circular, moving from being over the south pole to being over the north pole in just under an hour. The altitude was chosen to make the orbit Sun-synchronous, so that all images that were taken by the spacecraft of the same surface features on different dates were taken under identical lighting conditions. After each orbit, the spacecraft viewed the planet 28.62° to the west because Mars had rotated underneath it. In effect, it was always 14:00 for Mars Global Surveyor as it moved from one time zone to the next exactly as fast as the Sun. After seven sols and 88 orbits, the spacecraft would approximately retrace its previous path, with an offset of 59 km to the east. This ensured eventual full coverage of the entire surface. In its extended mission, MGS did much more than study the planet directly beneath it. It commonly performed rolls and pitches to acquire images off its nadir track. The roll maneuvers, called ROTOs (Roll Only Targeting Opportunities), rolled the spacecraft left or right from its ground track to shoot images as much as 30° from nadir. It was possible for a pitch maneuver to be added to compensate for the relative motion between the spacecraft and the planet. This was called a CPROTO (Compensation Pitch Roll Targeting Opportunity), and allowed for some very high resolution imaging by the onboard MOC (Mars Orbiting Camera). In addition to this, MGS could shoot pictures of other orbiting bodies, such as other spacecraft and the moons of Mars. In 1998 it imaged what was later called the Phobos monolith, found in MOC Image 55103. After analyzing hundreds of high-resolution pictures of the Martian surface taken by the orbiting Mars Surveyor spacecraft, a team of researchers found that weathering and winds on the planet create landforms, especially sand dunes, remarkably similar to those in some deserts on Earth. The planet was found to have a layered crust to depths of 10 km or more. To produce the layers, large amounts of material had to be weathered, transported and deposited. Layers in an old crater in Arabia, as seen by Mars Global Surveyor (MGS), under the MOC Public Targeting Program. Layers may form from volcanoes, the wind, or by deposition under water. The craters on the left are pedestal craters. Layers in crater found within the Schiaparelli crater basin as seen by Mars Global Surveyor. Image from the Sinus Sabaeus quadrangle. Buttes and layers in Aeolis quadrangle, as seen by Mars Global Surveyor. The northern hemisphere is probably just as cratered as the southern hemisphere, but the craters are mostly buried. Many features, like impact craters, were buried, then recently exhumed. Crater that was buried in another age and is now being exposed by erosion, as seen by the Mars Global Surveyor under the MOC Public Targeting Program. Image is located in the Noachis quadrangle. Lava flows were once covered over, now these platy flows are being exposed. Crater was buried, now it is being exhumed by erosion. Image located in Ismenius Lacus quadrangle. The northern hemisphere appears smooth, but the craters are covered over. Here, a group of craters are partially exposed. Image located in Cebrenia quadrangle. Hundreds of gullies were discovered that were formed from liquid water, possible in recent times. Group of gullies on north wall of crater that lies west of the crater Newton (41.3047 degrees south latitude, 192.89 east longitude). Image taken by Mars Global Surveyor, MOC Public Targeting Program. Image is located in the Phaethontis quadrangle. Gullies in a crater in Eridania quadrangle, north of the large crater Kepler. Also, features that may be remains of old glaciers are present. One, to the right, has the shape of a tongue. Picture taken under the MOC Public Targeting Program. Gullies on one wall of Kaiser Crater. Gullies usually are found in only one wall of a crater. Full color image of gullies on wall of Gorgonum Chaos. Image is located in the Phaethontis quadrangle. Large areas of Mars are covered by a mantle that coats all but the very steepest slopes. The mantle is sometimes smooth, sometimes pitted. Some believe the pits are due to the escape of water through sublimation (ice changing directly to a vapor) of buried ice. Close up image of Phaethontis surface taken by Mars Global Surveyor, under MOC Public Targeting Program. Pits are thought to be caused by buried ice turning into a gas. The mantle drapes most of the area. Note the absence of boulders on the cliff face. An area that shows the edges of the mantle is circled. Image located in Ismenius Lacus quadrangle. Mantle material, as seen by MGS. Steep cliff in Ismenius Lacus quadrangle with smooth mantle covering its face. Picture taken under MOC Public Targeting Program. Some areas are covered by hematite-rich material. The hematite could have been put in place by liquid water in the past. Dark streaks were found to be caused by giant dust devils. Dust devil tracks were observed to frequently change; some changed in just one month. Pattern of large and small tracks made by giant dust devils as seen by Mars Global Surveyor, under the MOC Public Targeting Program. Image is located in Eridania quadrangle. Kepler (Martian crater) showing dust devil tracks, as seen by Mars Global Surveyor. Kepler is a large crater in the Eridania quadrangle. Dust devil, as seen by MGS. Dust devil in action showing shadow to the right. Image located in Cebrenia quadrangle. The south pole's residual cap was observed to look like Swiss cheese. The holes are generally a few meters deep. The holes get bigger each year, so this region or hemisphere may be warming. Claims that this represents a global trend, however, are cherry-picking regional data versus the planetary dataset, and MOC results versus TES and radio science (see below). Changes in south pole from 1999 to 2001, as seen by Mars Global Surveyor. Notice how Swiss-cheese type holes have grown in the two years. Swiss cheese terrain, as seen by MGS. Largest mesa in image is 4 meters high. Layers in Swiss cheese terrain. There is a bright upper layer and a darker lower layer. Close-up view of Swiss cheese terrain. Polygonal pattern was probably formed by shallow troughs. 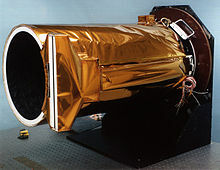 The Thermal Emission Spectrometer observes in infrared, for atmospheric studies and mineralogy. TES found that Mars' planetary climate has cooled since Viking, and just about all of the surface of Mars is covered with volcanic rock. Ceraunius Tholus, one of many volcanoes found on Mars. Lava flows in the Tharsis quadrangle. Image shows both young and old lava flows from the base of Olympus Mons. The flat plain is the younger flow. The older flow has channels with levees along their edges. The presence of levees is quite common in many lava flows. Small volcano in Phoenicis Lacus quadrangle. Image covers a distance 1.9 mi (3.1 km) long. Hundreds of house-sized boulders were found in some areas. This indicates that some materials are strong enough to hold together, even when moving downslope. Most of the boulders appeared in volcanic regions so they were probably from weathered from lava flows. House-sized boulders are scattered throughout this image. These boulders are near Ascraeus Mons, a Martian volcano. Volcanoes on Mars probably form hard boulders made up of basalt that is resistant to erosion in the current environment of Mars. Thousands of dark slope streaks were observed. Most scientists believe they result from the avalanching of dust. However, some researchers think that water may be involved. Many streaks underwent changes during the many years that MGS functioned. 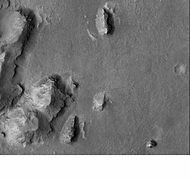 Tikonravev Crater floor, as seen by Mars Global Surveyor. Click on image to see dark slope streaks and layers. Tikonravev Crater is in the Arabia quadrangle. Dark streaks in Diacria quadrangle, as seen by Mars Global Surveyor, under the MOC Public Targeting Program. Data from MGS have been used to perform a test of the general relativistic Lense–Thirring precession which consists of a small precession of the orbital plane of a test particle moving around a central, rotating mass such as a planet. The interpretation of these results has been debated. On 6 December 2006 NASA released photos of two craters in Terra Sirenum and Centauri Montes which appear to show the presence of flowing water on Mars at some point between 1999 and 2001. The pictures were produced by Mars Global Surveyor and are quite possibly the spacecraft's final contribution to our knowledge of Mars and the question of whether water exists on the planet. Hundreds of gullies were discovered that were formed from liquid water, possible in recent times. These gullies occur on steep slopes and mostly in certain bands of latitude. A few channels on Mars displayed inner channels that suggest sustained fluid flows. The most well-known is the one in Nanedi Valles. Another was found in Nirgal Vallis. 7 November 1996: Launch from Cape Canaveral. 11 September 1997: Arrival at Mars, began orbit insertion. 1 April 1999: Primary mapping phase began. 1 February 2001: First extended mission phase began. 1 February 2002: Second extended mission phase began. 1 January 2003: Relay mission began. 30 March 2004: Surveyor photographed the Mars Exploration Rover Spirit along with its wheel tracks showing its first 85 sols of travel. 1 December 2004: Science and Support mission began. 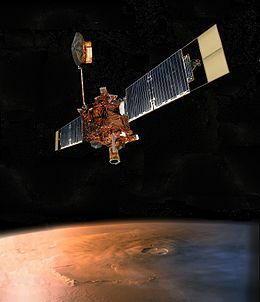 April 2005: MGS became the first spacecraft to photograph another spacecraft in orbit around a planet other than Earth when it captured two images of the Mars Odyssey spacecraft and one image of the Mars Express spacecraft. 1 October 2006: Extended mission phase began for another two years. 2 November 2006: Spacecraft suffers an error while attempting to reorient a solar panel and communication was lost. 5 November 2006: Weak signals were detected, indicating the spacecraft was awaiting instructions. The signal cut out later that day. 21 November 2006: NASA announces the spacecraft has likely finished its operating career. 6 December 2006: NASA releases imagery taken by MGS of a newly found gully deposit, suggesting that water still flows on Mars. 13 April 2007: NASA releases its Preliminary Report on the cause(s) of MGS' loss of contact. On 2 November 2006, NASA lost contact with the spacecraft after commanding it to adjust its solar panels. Several days passed before a faint signal was received indicating that the spacecraft had entered safe mode and was awaiting further instructions. On 20 November 2006, the Mars Reconnaissance Orbiter spacecraft attempted to image Mars Global Surveyor to verify the orientation of the spacecraft. The effort was unsuccessful. On 21 November and 22, 2006, Mars Global Surveyor failed to relay communications to the Opportunity rover on the surface of Mars. In response to this complication, Mars Exploration Program manager Fuk Li stated, "Realistically, we have run through the most likely possibilities for re-establishing communication, and we are facing the likelihood that the amazing flow of scientific observations from Mars Global Surveyor is over." On 13 April 2007, NASA announced the loss of the spacecraft was caused by a flaw in a parameter update to the spacecraft's system software. The spacecraft was designed to hold two identical copies of the system software for redundancy and error checking. Subsequent updates to the software encountered a human error when two independent operators updated separate copies with differing parameters. This was followed by a corrective update that unknowingly included a memory fault which resulted in the loss of the spacecraft. Previously, in November 2005, two operators had changed unknowingly, the same parameter on separate copies of the system software. Each operator had used a slightly different precision when inputting a parameter, which resulted in a small but significant difference in the two copies. A subsequent memory readout revealed this inconsistency to the mission's team. In order to correct the error, an update was drafted in June 2006. However, two memory addresses were incorrectly handled in the update, which could allow values to be written into the wrong memory addresses and further complications with the mission. Five months later, the problematic memory addresses were called, resulting in the solar arrays being driven until they hit a hard stop and became unmovable. The complication led the spacecraft to incorrectly diagnose a failure of a gimbal motor causing the spacecraft to rotate to allow the unmovable solar array to point toward the Sun. However, in this position the remaining usable battery was also directed toward the Sun, resulting in the battery overheating and eventually failing. The spacecraft subsequently went into safe mode and contact with the spacecraft was lost. Originally, the spacecraft was intended to observe Mars for 1 Martian year (approximately 2 Earth years). However, based on the vast amount of valuable science data returned, NASA extended the mission three times. The MGS remains in a stable near-polar circular orbit at about 450 km altitude, and will crash onto the surface of the planet in about 2047. 2 geysers, taken by Mars Global Surveyor and released on 16 October 2000. Surface of Mars taken by Mars Global Surveyor. Surface of Mars taken by Mars Global Surveyor on 10 August 1999. The Mars rover Spirit's landing site and tracks taken by Mars Global Surveyor. The Mars Express spacecraft image taken by Mars Global Surveyor. 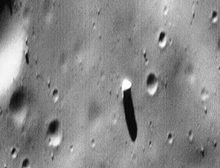 The Mars Odyssey spacecraft image taken by Mars Global Surveyor. Layers in the canyon wall in Coprates quadrangle, as seen by Mars Global Surveyor, under MOC Public Targeting Program. 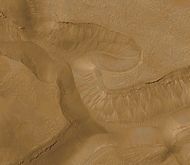 Banded or taffy-pull terrain in Hellas, as seen by Mars Global Surveyor. Origin is unknown at present. Lava flow in Elysium. There are many lava flows in the Elysium quadrangle. In this one, the lava flowed toward the upper right. Image taken by Mars Global Surveyor, under the MOC Public Targeting Program. Bright rays caused by impact throwing out a bright lower layer. Some bright layers contain hydrated minerals. Picture taken by Mars Global Surveyor. Location is Memnonia quadrangle. Mars Global Surveyor photograph of Opportunity rover's landing site showing "hole in one." Inverted channels in Aeolis quadrangle. It is believed that stream channels became raised features after coarse materials were deposited and cemented. Picture probably is of a delta that formed in a huge lake. The area is of great interest to geologists. Evidence of past microbial life may be found in this location. Pavonis Mons, located on the equator in Tharsis quadrangle. The Phobos monolith (right of center) as taken by Mars Global Surveyor (MOC Image 55103) in 1998. ^ a b c d e f Mars Global Surveyor Orbital Information Aerobraking Orbit Elements (TBL). mars.jpl.nasa.gov (Technical report). December 2004. ^ a b "Mar Global Surveyor - Science Summary". NASA. Jet Propulsion Laboratory. Retrieved 6 October 2013. ^ a b "MGS - Science Objectives". NASA. JPL. Retrieved 6 October 2013. ^ "Design and Development of the Mars Observer Camera". Msss.com. 16 September 1992. Retrieved 7 October 2010. ^ "Space Cameras, Operations, and Science - Malin Space Science Systems". Msss.com. Retrieved 7 October 2010. ^ Michael C. Malin; Kenneth S. Edgett; Bruce A. Cantor; Michael A. Caplinger; G. Edward Danielson; Elsa H. Jensen; Michael A. Ravine; Jennifer L. Sandoval; Kimberley D. Supulver (6 January 2010). "An overview of the 1985–2006 Mars Orbiter Camera science investigation". Mars - the International Journal of Mars Science and Exploration. 5: 1–60. Bibcode:2010IJMSE...5....1M. doi:10.1555/mars.2010.0001. ^ "NASA Mars Spacecraft Gear Up for Extra Work" (Press release). NASA. 25 September 2006. Retrieved 19 May 2009. ^ Optech press release, "Canadian Mission Concept to Mysterious Mars moon Phobos to Feature Unique Rock-Dock Maneuver", 3 May 2007. ^ PRIME: Phobos Reconnaissance & International Mars Exploration Archived 2008-05-10 at the Wayback Machine, Mars Institute website. Retrieved 27 July 2009. ^ Thomas, Peter C.; and Veverka, Joseph "Bright Sand Dunes on Mars Could Be Mounds of Sulfates. [Web links]". myeducationresearch.org, The Pierian Press, 18 Feb 1999. Online. Internet. 18 May 1743. Archived from the original on 27 July 2011. Retrieved 30 November 2010. ^ Malin, M.C. ; Edgett, K.S. (25 October 2001). "Mars Global Surveyor Mars Orbiter Camera: Interplanetary cruise through primary mission" (PDF). Journal of Geophysical Research. 106 (E10): 23429–23570. Bibcode:2001JGR...10623429M. doi:10.1029/2000JE001455. ^ Malin, M. C.; Edgett, Kenneth S. (2000). "Mars Global Surveyor MOC2-1618 Release". Science. 288 (5475): 2330–2335. Bibcode:2000Sci...288.2330M. doi:10.1126/science.288.5475.2330. Retrieved 7 October 2010. ^ "Changing Mars Gullies Hint at Recent Flowing Water". SPACE.com. 6 December 2006. Retrieved 7 October 2010. ^ "Mars Global Surveyor MOC2-239 Release". Mars.jpl.nasa.gov. Retrieved 7 October 2010. ^ "The Lure of Hematite". NASA. 28 March 2001. Retrieved 16 August 2017. ^ "Mars Global Surveyor MOC2-281 Release". Mars.jpl.nasa.gov. 24 May 2001. Retrieved 7 October 2010. 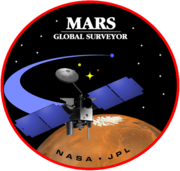 ^ "Mars Global Surveyor MOC2-367 Release". Msss.com. 21 May 2003. Retrieved 7 October 2010. ^ "Mars Water, Odd Surface Features Tied to Life". SPACE.com. 28 March 2003. Retrieved 7 October 2010. ^ "Mars Global Surveyor MOC2-284 Release". Mars.jpl.nasa.gov. Retrieved 7 October 2010. ^ Krogh K. (November 2007). "Comment on 'Evidence of the gravitomagnetic field of Mars'". Classical and Quantum Gravity. 24 (22): 5709–5715. Bibcode:2007CQGra..24.5709K. doi:10.1088/0264-9381/24/22/N01. ^ Iorio L. (June 2010). "On the Lense-Thirring test with the Mars Global Surveyor in the gravitational field of Mars". Central European Journal of Physics. 8 (3): 509–513. arXiv:gr-qc/0701146. Bibcode:2010CEJPh...8..509I. doi:10.2478/s11534-009-0117-6. ^ "One Mars orbiter takes first photos of other orbiters". NASA/Jet Propulsion Laboratory news release. Retrieved 17 June 2005. ^ "Mars rover, Global Surveyor, Odyssey missions extended". Retrieved 27 September 2006. ^ Shiga, David (9 November 2006). "NASA struggles to contact lost Mars probe". New Scientist. Retrieved 9 November 2006. ^ a b c d "Mars Global Surveyor (MGS) Spacecraft Loss of Contact" (PDF). NASA. 13 April 2007. Retrieved 28 December 2010. ^ "Orbiter may be last chance to rescue Mars probe". CNN. Reuters. 13 November 2006. Archived from the original on 18 November 2006. Retrieved 19 May 2009. ^ "NASA's Mars Global Surveyor May Be at Mission's End" (Press release). NASA. 21 November 2006. Retrieved 19 May 2009. ^ "Report Reveals Likely Causes of Mars Spacecraft Loss" (Press release). NASA. 13 April 2007. Retrieved 19 May 2009. ^ Dunn, Marcia (27 October 1996). "NASA Takes No Dirty Chances With Mars Rover". Los Angeles Times. Retrieved 3 August 2015. It's expected to orbit Mars for at least 50 years before crashing onto the surface of the planet. 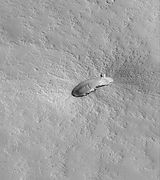 ^ "Mars Global Surveyor Aerobraking at Mars". mars.jpl.nasa.gov. Wikimedia Commons has media related to Mars Global Surveyor. 04/13/07: Mars Global Surveyor: Report Reveals Reasons for Loss.